The UK Team met at Prinknash in early March specifically to discuss the website – it is envisaged that in the next few months the website will become more mobile friendly – watch this space! We had a short Team meeting at the end of the Retreat at Douai and we were brought up to date with the registration for the Congress. We were disappointed with the level of take up by the UK communities and hope this will improve over the next few weeks. We hope to meet again in June. The National Oblate Retreat at Mt St Bernard had been a great success and already a booking has been made for October 2018! So keep an eye on the website for more details nearer the time. Our next Team meeting will be at the end of the National Oblate Retreat at Douai next March. 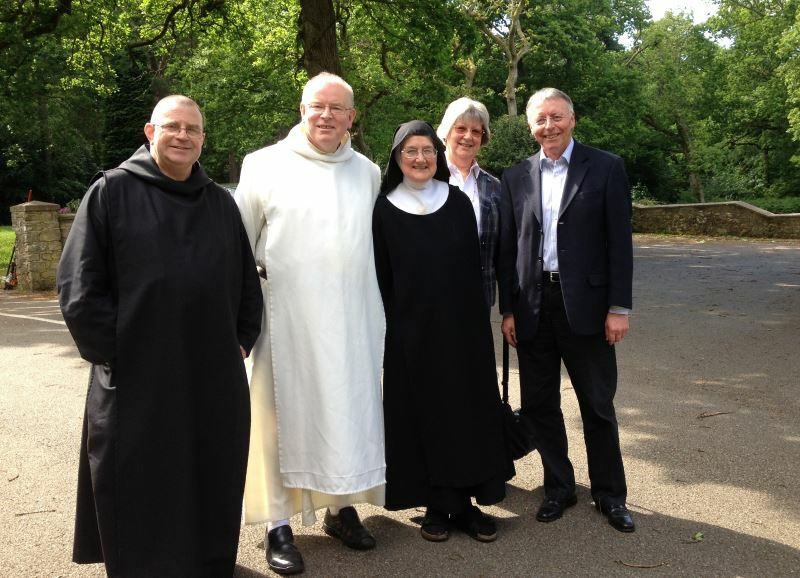 Five members of the Team journeyed to Downside Abbey on 18th June for a most useful meeting. We were given more details of next year’s International Benedictine Oblates Congress in Rome and we were pleased to learn that the majority of Benedictine communities in the UK and Ireland had responded to the census – details of which have been forwarded to the organisers in Rome. Numbers attending the National Retreat at Mt St Bernard in October are very encouraging, as also are the number of ‘hits’ on the website. During our lunch break we made a brief pilgrimage to Downside Abbey Church. We are planning to hold our next meeting nearer to London when hopefully more of the Team will be able to attend. Prinknash Abbey hosted the first Team meeting of 2016 on 16th January. Our International co-ordinator, Klara, reported to the Team following her Congress meeting in Rome and a 7th National Retreat was agreed for March 2017. Further details of these appear in the relevant sections of the website. 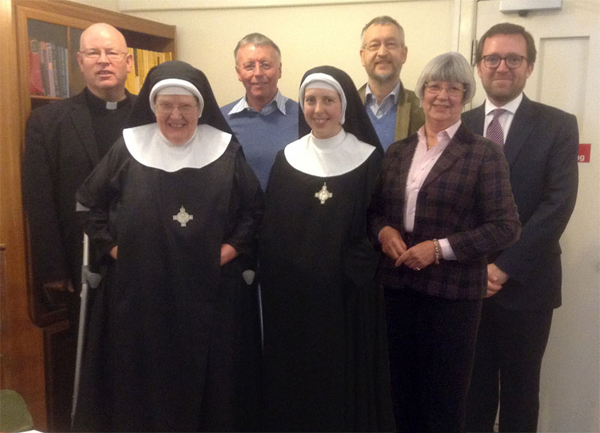 The Team met at Tyburn Convent, London, last Saturday (3.10) and received truly Benedictine hospitality. Before we resumed after lunch M.Lioba gave us a most interesting and heartfelt talk of what happened at Tyburn a few centuries ago – not something for a patriotic English person to be proud of. Again it was quality rather than quantity of Team members but we were able to discuss constructively the items on the agenda, and in particular, formulate clear suggestions for Klara to take to the planning meeting in November. M.Prioress and M. Oblate Mistress were able to sit in on our meetings and this was greatly appreciated. It appears from our website that the Team has not met since November 2014 – this is not correct! The reason for the silence was initially because after our meeting at Prinknash at the end of January we were looking into our next meeting being at Lambeth Palace. However, even with a huge reduction in costs for the day we would still be expected to pay £200+ which was just ‘not on’. So, we met at St Augustine’s Priory, Chilworth, near Guildford, a couple of weeks ago. 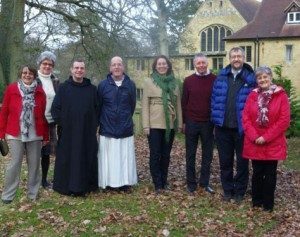 It was lovely to return again to Chilworth and the community is now well settled into their surroundings – peaceful monastic grounds amongst the built-up areas of Surrey. It was quality rather than quantity of Team members (!) but the items on the agenda – Retreat : Congress : Website : AOB – were constructively discussed ably assisted by the Oblate Master of Chilworth, Fr Dunstan. We are hoping to meet later in the year at Tyburn, in the centre of London, but before then we look forward to the National Oblates Retreat 4-6 September at Douai. The good news is that the Fourth International Congress of Oblates in Rome in October 2017 is scheduled to go ahead. l-r: Sr Benedict Gaughan, Minster; Revd Christopher Rowley, Elmore; Fr Philip Rozario, Ampleforth; Fr Timothy Gorham, Ealing; Fr Mark Hargreaves, Prinknash; Stephen Day, Prinknash; Klara Brunnhuber, Douai; Fr Gervase Holdaway, Douai; Thomas Brunnhuber, Douai; Frances Bailess, Minster; Pam Morey, Prinknash; Sr Laurentia Johns, Stanbrook. 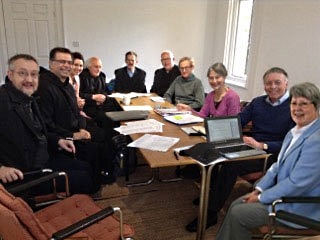 Oblate Directors held a meeting at Ealing Abbey on 8th November, to which members of the UK Oblates Team were invited. Directors were present from Ampleforth, Douai, Ealing, Minster, Prinknash and Stanbrook. Team members present represented Douai, Elmore, Minster and Prinknash. The National Coordinator for the 4th International Benedictine Oblates Congress in Rome in 2017, Klara Brunnhuber, gave a report to the meeting on the last Congress and brought them up to date on plans for the next Congress. The Directors were advised that the Team had taken a half page advertisement in the 2015 Benedictine Yearbook which should widen the interest of Oblates. The 4th National Annual Retreat is scheduled for 4-6 September at Douai and Fr Gervase, one of the Directors present on Saturday, has agreed to be the Facilitator for the weekend. The latest statistics of ‘hits’ for the Benedictine-Oblates website were discussed – these come from all over the world and go some way to making the website a worthwhile enterprise for the Team. Another Oblate Directors meeting will be organised nearer to the date for the next Congress when it will hopefully be possible to discuss Oblates representing their Monasteries at this event. As mentioned in the report following our Team meeting in May, we met again at the end of July at Belmont Abbey, Hereford. Another memorable setting. Summer is always a difficult time to bring everyone together and this occasion was no exception. However, quantity moved to quality with the addition of an Oblate from Pluscarden, John McKinlay, who has been co-opted on to the Team (with the support of his Oblate Master) to assist in the monthly updating of the front page of the website. Br Bernard at Belmont made us most welcome and we are looking forward to returning again before too long. September sees the National Oblates Retreat at Ampleforth Abbey and in November the Benedictine Oblate Masters and Mistresses will be meeting at Ealing Abbey and at their invitation we will all hopefully be present. We are, as a Team, blessed by the venues of our Team meetings and the welcome we receive from our Benedictine hosts! 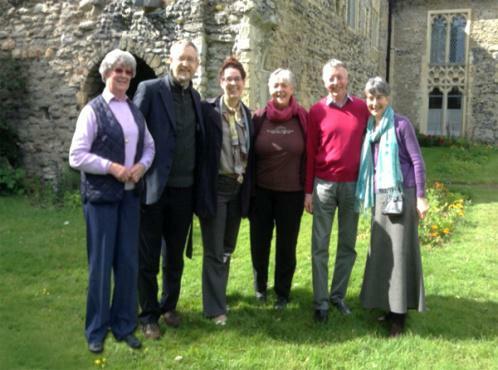 Our last meeting in early May took place over a weekend at Minster in Kent where we were the guests of the nuns of the Priory of St Mildred, Minster Abbey. A truly wonderful setting and one I would recommend any Oblate to try to visit. 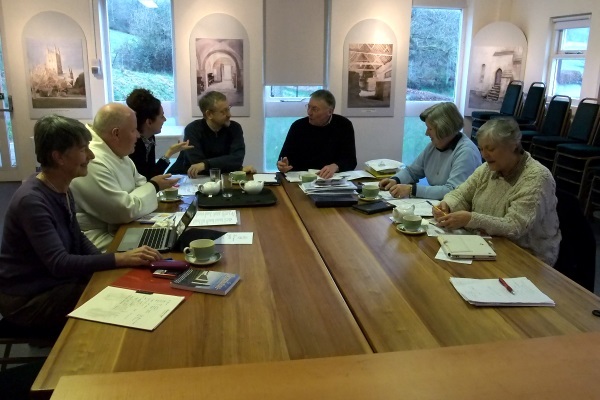 We were able to discuss the National Oblates Retreat which we are organising at Ampleforth in September this year and also the arrangements being made by Rome for the next Oblates Congress in October 2017 – it is necessary to begin the initial organisation sooner rather than later. Another item which emerged from our discussions is a meeting of Oblate Directors at Ealing Abbey later in the year. The last such meeting took place in June 2012 and, we as a Team, feel extremely privileged that we are included in the agenda for such a meeting. The website is always an item on the agenda for our meetings and several new points are being incorporated by our website manager, Roddy Maddocks. Our next Team meeting is scheduled for July at Belmont in the attractive countryside of Herefordshire – we really are able to appreciate our beautiful countryside when travelling to our meetings! 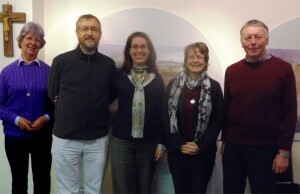 The Team held a ‘way forward’ meeting at Brownshill Monastery, Stroud, on the last weekend in January. It was combined with a reminiscence meeting of the UK delegates who had attended the Congress in Rome last October, together with four members of the WCCM (World Community for Christian Meditation) who were also at the Congress. It was a truly wonderful weekend – 13 of us for Saturday lunch: 6 Team members, 4 WCCM members and 3 UK delegates. Klara Brunnhuber (Douai) put her name forward as the National Coordinator for the 4th World Congress of Benedictine Oblates in Rome in 2017 (with the backing of her Oblate Director), and the Team were happy to accept her in this role. Frances Bailess (Minster), one of the UK delegates, is stepping into the role of Secretary in place of Sally Mercer (Prinknash) who will continue to be a member of the Team. Sr Benedict Gaughin, Oblate Mistress at Minster, and Fr Martin McLaughlin, Oblate Master at Prinknash have also joined the Team for future meetings. We have been meeting as a Team now for over three years and have developed a great bond of Benedictine friendship – still very much members of our own Benedictine community but greatly appreciating the contact and exchange of ideas that we are able to enjoy together. Those present were enlightened, interested and privileged to learn about the WCCM (also referred to as ‘Monastery without Walls’). As a result Eileen Dutt, their UK National Coordinator, has been invited to join the Team and we are delighted that she has accepted. The Team feels it now has an even broader base from which to continue its spiritual journey. On Sunday, Roddy Maddocks (Oblate and Oblate Website Coordinator at Douai Abbey) spent some time with some members to discuss how we could brighten up our window on the world, i.e. this website. No extreme makeover or glitzy update – just a wider input of articles, a newsletter etc – he will be working closely with UKOT – so watch this space. We have pencilled in our diaries three future Team meetings for this year – 17th May, 26th July and 18thOctober – venues to be arranged. November has come and gone and five members of the Team met at Prinknash in the middle of the month to primarily discuss the Third World Congress of Benedictine Oblates. The National Coordinator’s report appears elsewhere on our site, but those present unanimously agreed that the Congress had been very successful and that those of us who were fortunate to attend had greatly benefited from our good fortune. Meeting and talking with some 156 Oblates from 23 countries broadens one’s outlook on both the interpretation of the Rule and one’s individual vocation. The wonderful news at the end of the Congress was that a Fourth Congress is planned for 2017. The next Team meeting is being held at the Cistercian Abbey at Brownshill, near Stroud in January (weather permitting!). Those UK delegates who were at the Congress have been invited to sit in at this meeting, prior to a ‘get together’ later in the day to exchange reminiscences. The January meeting is most important because the UK Oblates Team will be reviewing the way forward for the next four years and as some members of the Team are stepping down, new members will be sought to fill their jobs. Six members of the UK Oblate Team attended the 3rd World Congress for Benedictine Oblates 4th to 10th October in Rome: Stephen Day (Prinknash Abbey), Thomas Brunnhuber (Oblate at Douai Abbey and National Coordinator for the UK), Martin Gardner (Pluscarden Abbey), Klara Brunnhuber (Douai Abbey), Gerry Reilly (St Benedict’s Priory, Salisbury) and Pam Morey (Prinknash Abbey). 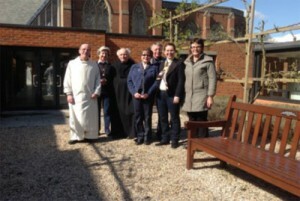 Douai Abbey is a wonderful host, and five members of the UK Oblates Team – Pam, Stephen, Sally, Klara and Marie – were fortunate to meet there again at the end of April. They were joined by Fr Martin McLaughlin, the Oblate Master of Prinknash Abbey, and Fr Gervase Holdaway, the Oblate Master of Douai. The first item to be discussed was the National Retreat which is being held at Douai next weekend, 10-12th May. Although the numbers are not as great as in the past the Team considered there were more than sufficient Oblates intending to attend to make Fr Stephen Horton’s time worthwhile. The World Congress of Oblates scheduled for October is also lacking in numbers and it is thought that the main reason for this is the present economic climate. Although a wonderful chance to meet other Oblates from all over the world, and be able to visit the birthplace of Benedictine life, it is an expensive exercise and not one that many are in a position to enjoy. The National Coordinator, Thomas Brunnhuber, is still hopeful that the quota given to the UK by Rome will be reached – there is still time for any Oblate Master/Mistress who has not yet chosen a delegate to do so. Those delegates who will be representing the UK will be meeting at Ealing Abbey at the end of June. For some months now, behind the scenes, the website has been undergoing a makeover. It will not appear very different to those Oblates who visit the site on a regular basis, but from the beginning of July it will be easier for members of the Team to update when necessary. Douai always makes the Team most welcome and their grateful thanks were extended to Fr Gervase for spending time that day with them and for the hospitality they received. Team members, Pam, Stephen, Thomas, Klara, Sally, and Zina were joined by Fr Martin from Prinknash for their first meeting in 2013. 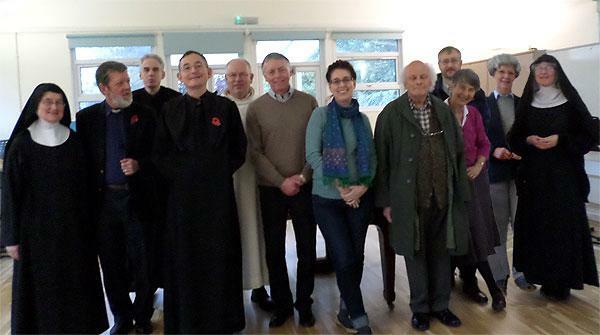 The team journeyed to Chilworth Abbey last weekend and Fr Dunstan, the Oblate Master at Chilworth, was our host. Chilworth is now the home of the Benedictine community who used to live at Ramsgate. A little like the community at Prinknash, as their numbers were dwindling, they decided to ‘down size’ and in the spring of 2011 they moved to the Franciscan Friary at Chilworth. Again, we were blessed by Fr Dunstan celebrating Mass for us before we began our day’s discussions. The main subjects on the agenda were the National Oblate Retreat which is taking place at Douai Abbey 10-12 May, and the International Oblate Congress in Rome on 4-10 October. More information on both these issues can be read elsewhere on our website. We are always very grateful for the welcome and hospitality that we receive at the different venues where we hold our meetings and our thanks were expressed to Fr Dunstan, and his community, on Saturday. We have been meeting as a Team now for some two years and have developed a great bond of Benedictine friendship – still very much member’s of our own Benedictine community but greatly appreciating the contact and exchange of ideas that we are able to enjoy together. If you, as an Oblate of St Benedict, feel that you would like to join us later this year, after the Congress, perhaps, after praying about it and talking with your Oblate Master/Mistress, you would like to contact us. Nine members of the UK Oblates Team met for yet another fruitful meeting on 3rd November 2012 – Pam Morey, Stephen Day and Sally Mercer, Oblates of Prinknash; Klara and Thomas Brunnhuber and Zina Neagle, Oblates of Douai; Marie Liveing, Oblate of St Cecilia’s; Gerry Reilly, Oblate of St Benedict’s, Salisbury; Martin Gardner, Oblate of Pluscarden. Fr Martin McLaughlin, the Bursar and one of the Oblate Masters at Prinknash Abbey, was able to sit in on the meeting, and Paul Mahoney, who has been responsible for the website for the past four years, had been invited to attend. The Team began by gathering in the Abbey Chapel, where Fr Martin celebrated Mass on what turned out to be his feast day – a great way to begin Team deliberations! It was good for the Team to meet their webmaster, and for Paul to meet the people to whom he had spoken and e.mailed over several years. The website was, obviously, one of the main points of discussion, and also the outline planning for the National Oblates Retreat at Douai next May. Further details will be found on our website. As soon as the Organising Committee in Rome has relayed information regarding the International Oblates Congress in Rome in October 2013, details will be posted on the website. So watch this space….! 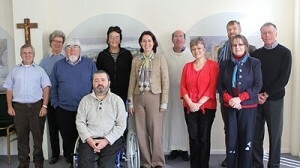 The Team was very grateful to Fr Martin and the Community at Prinknash for their hospitality – it was much appreciated. We hope to hold our next meeting in the Spring, venue to be confirmed. For information about previous UK Team meetings, please click here.